#76 – “Are you playing on the computer AGAIN?!! 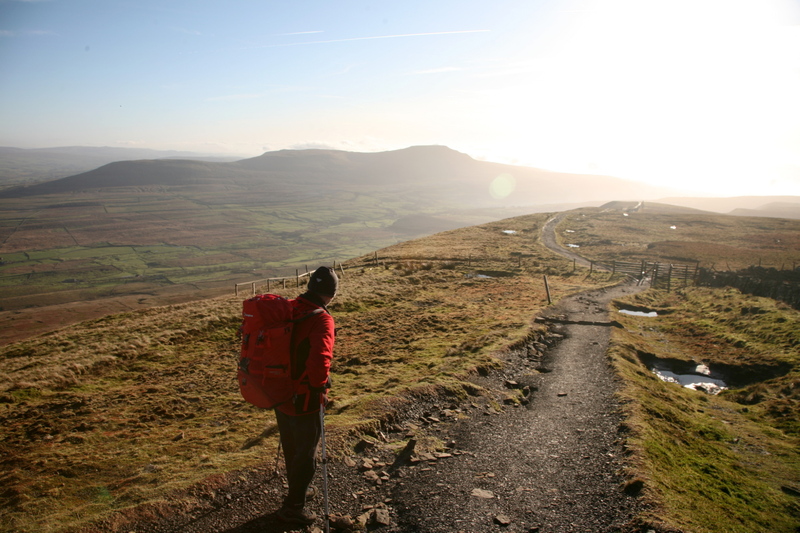 A few months back a friend asked me about my outdoor writing, along the lines of “But what do you DO?” I explained it something like this – “I go for a walk, I write about it, people throw money at me”. (Only in my dreams, that last bit!) In reality it’s nothing like as simple as that, and the walking part takes only a fraction of the total time. You might think that walking the route is the most obvious first stage in the process, but it usually starts before then. 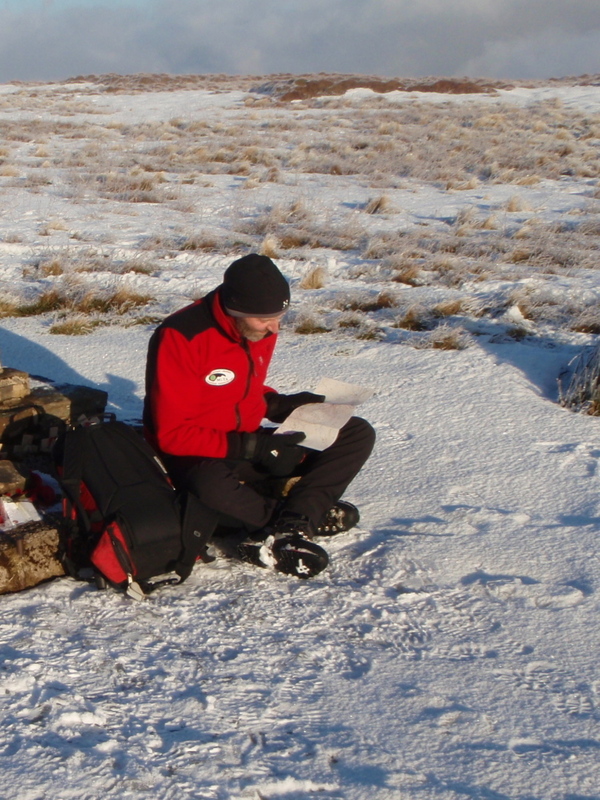 Most of my writing at the moment is for Walking World (WW) or Discovery Walking Guides (DWG) and depending on what the project is I usually begin by sitting at a desk, doing the planning. Digital mapping is used to speed things up, sometimes assisted by Google Earth. When I have worked out a suitable route and printed a map, it’s time to get out. 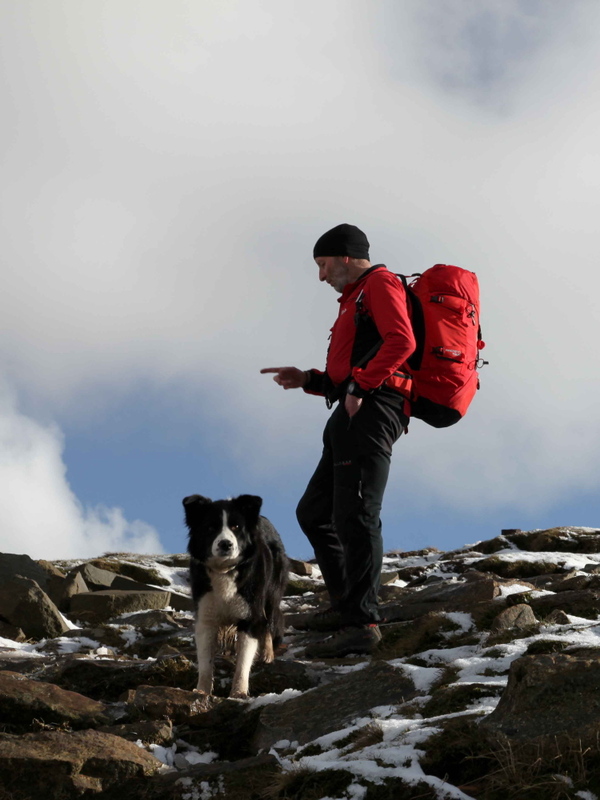 You will be able to recognise me if we meet on the hills – I’m the bloke talking into a digital voice recorder with two GPS receivers and a camera strapped to my rucksack. 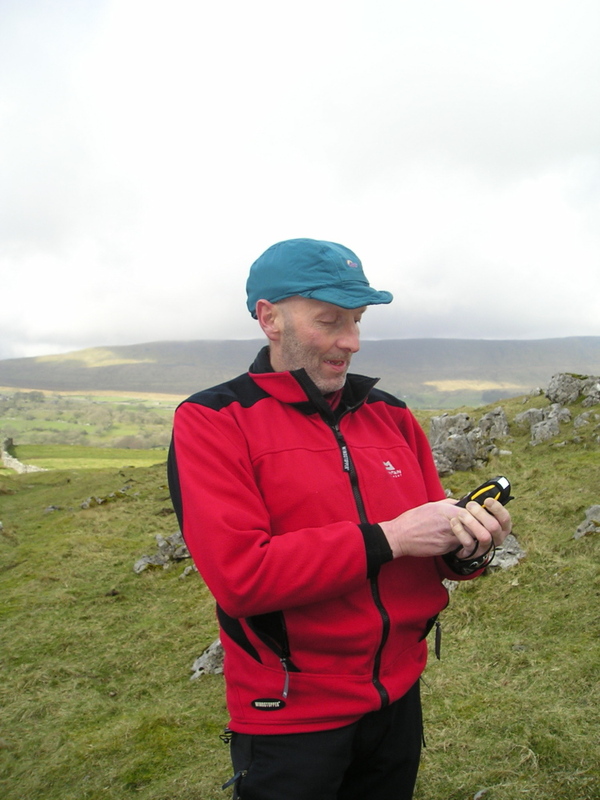 I use a Garmin eTrex GPS receiver to record positions on the ground (MM call them ‘waymarks’ DWG call them ‘waypoints’) – the Garmin also records a ‘track’ of where I have been, an important requirement for DWG. It’s simple to operate, even with gloves, and I can change batteries on the hill if I need to. I also use a Memory Map A2800 GPS receiver. 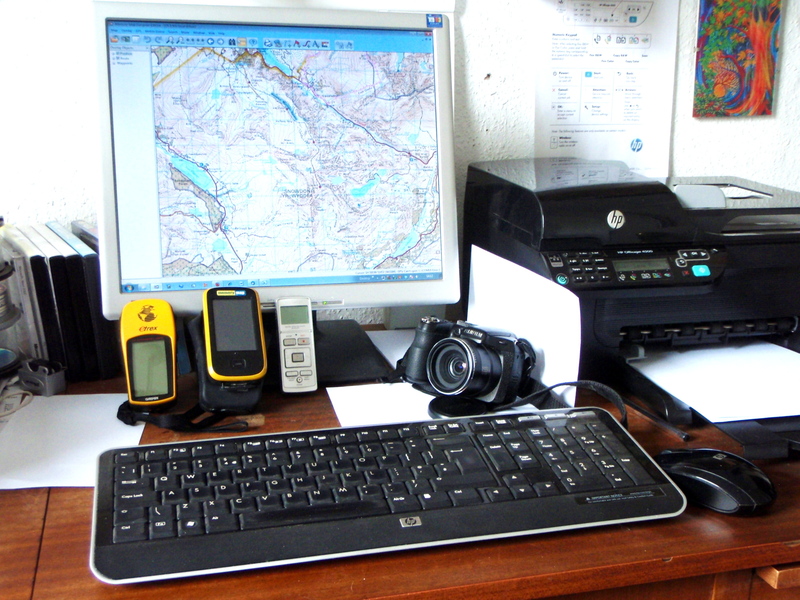 This has a moving map display, which saves a lot of time working out exactly where I am when recording a waymark/point – like the Garmin, it also records a ‘track’, which can be a useful backup if I have a problem with the Garmin ‘track log’. 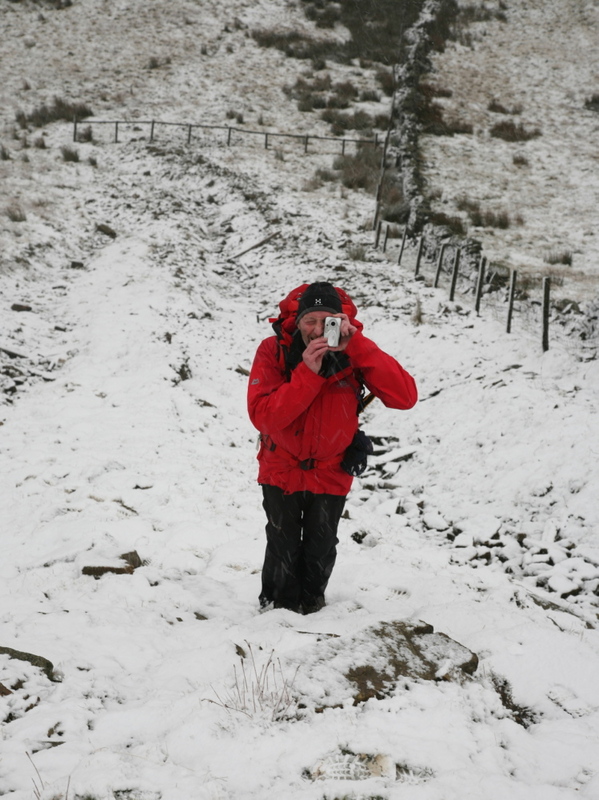 I also record a voice description of the route, and take loads of photographs, using the camera as a notebook. I’m sometimes joined by photographer mate John Bamber, who adds even more pics. 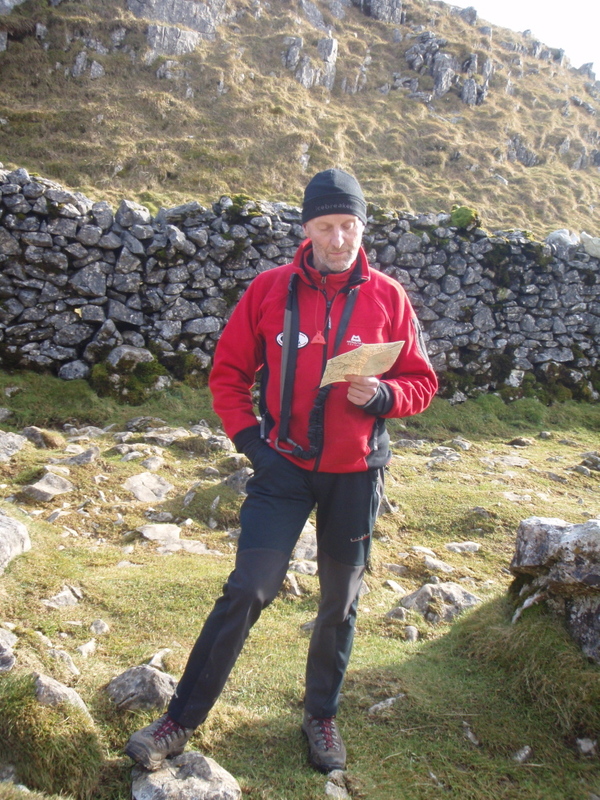 John Bamber working on the DWG guide to the Yorkshire Three Peaks Challenge. All the recorded data goes back to ‘Mission Control’, where I download the GPS tracks, voice recordings and images onto the computer. The next stage will take several days – MM want their routes split into ‘legs’ with a description of less than 120 words of text plus a photo, and DWG want timings between waypoints taken from the ‘track log’, and fewer photos. ‘Spikes’ on the ‘track log’ have to be cleaned up, photos edited and the text written in the correct style, depending on who it is for. Neither WW nor DWG want loads of ‘pretty photos’, which is where this blog comes in useful, giving me a chance to splash pics of great scenery on the internet, rather than letting them languish on a computer hard-drive. Once the route is finished the completed text, map and images are all emailed to the correct destination, and I get on with the next route. At the last count, I had 68 routes on the WW database, covering all the major upland areas of the UK from Ben Nevis to Bodmin Moor. 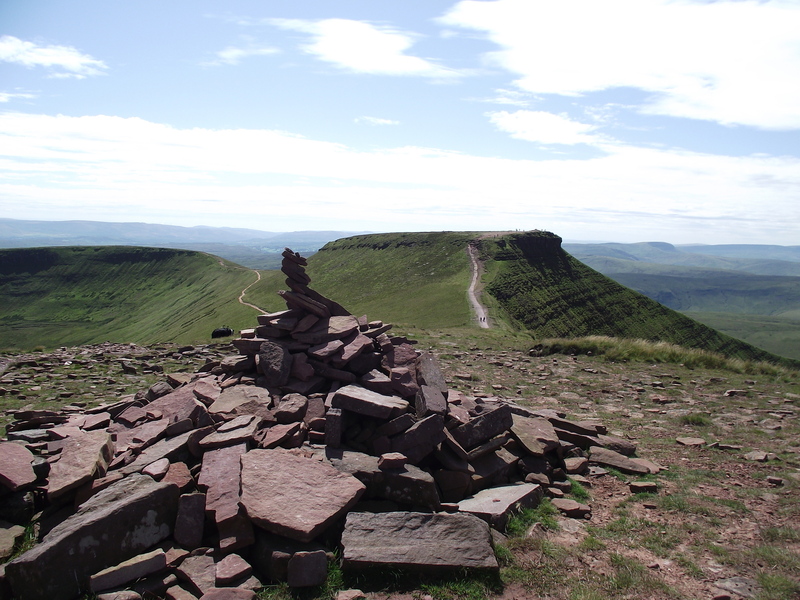 I’ve also had a Guide to the Yorkshire Three Peaks Challenge walk published by DWG, with a walking guide to Snowdonia currently in preparation for them. 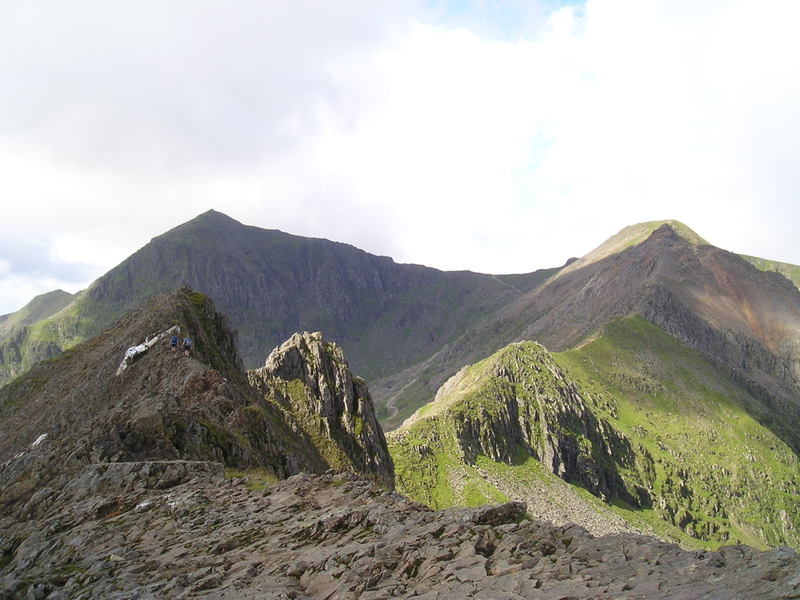 It all gives me a great excuse (if one were needed) to visit some fantastic mountain scenery – see you here next week for more of the same then! This entry was posted in 1. Scotland, 2. Lake District, 3. Yorkshire Dales, 4. Northern England, 5. 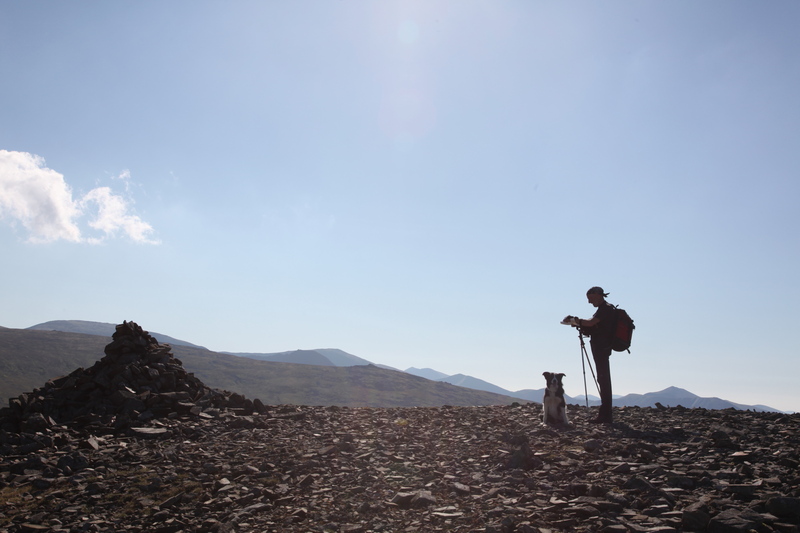 North Wales, 6. Mid and South Wales, 7. Everywhere Else! 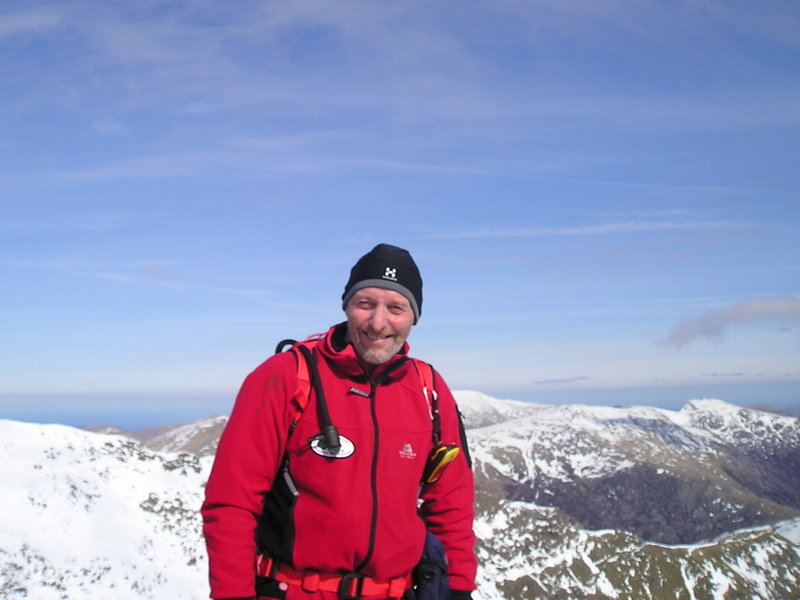 and tagged hillwalking, mountaineering, mountains, photography. Bookmark the permalink. 21 Responses to #76 – “Are you playing on the computer AGAIN?!! Trying to reply, but have to keep stopping to laugh out loud !!! Excellent article Paul…I keep thinking I will try selling to mags again but haven’t done so yet – too lazy probably. I did do a bit about 30 years ago though. Great photos by the way. Thanks for the comments on the photos – I’m still in awe of that High Street shot of yours – fantastic! If anything it adds to the fun, and an unexpected bonus is that I can remember the routes I’ve written in fairly good detail if I ever go back. I have to admit it sounds like a pretty idyllic job! Wouldn’t be for me having to be precise and use loads of technology… I’ll just have to stick to my own style of wittering about walking on my blog. Loved playing at guessing where all those photos were – think I got most of them. Is John Bamber at that waterfall below Whernside where you’ve just crossed the railway near Ribblehead Tunnel? The hardest thing about writing a route for different customers is that they have their own styles, and I have to stay focused on how they want the finished product. 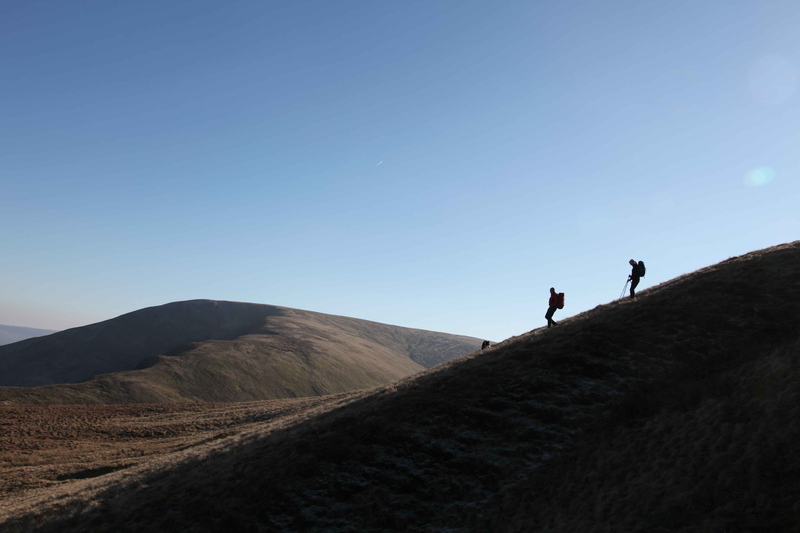 No, the End of the Day one looks a bit like the Moel Eilio hills… but I’d have to know whether they were Wales or not first. 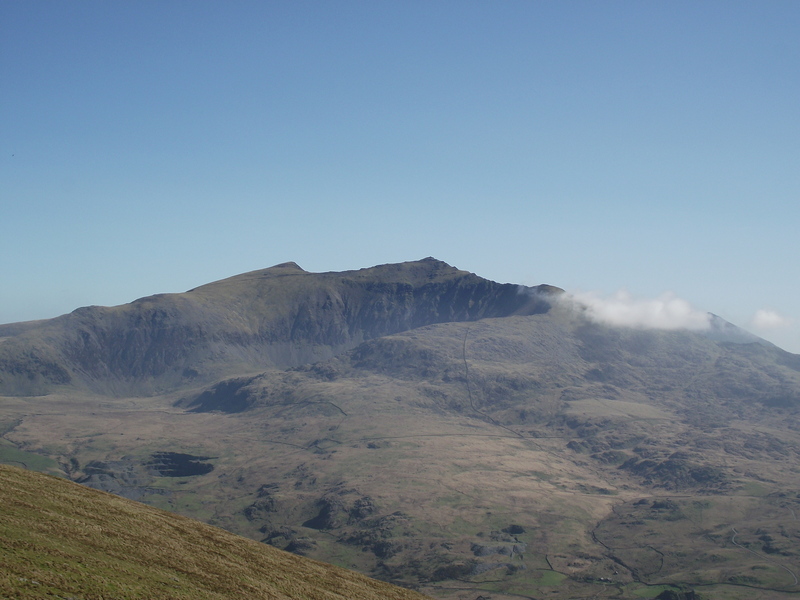 I wasn’t sure about the seaside one either but decided it was Welsh – Cadair Idris area perhaps? ‘End of the day’ is a hard one – it’s there because it captures the feel of finishing the walk (notice that the dog at the front as always!) so there are few features to give its location away. 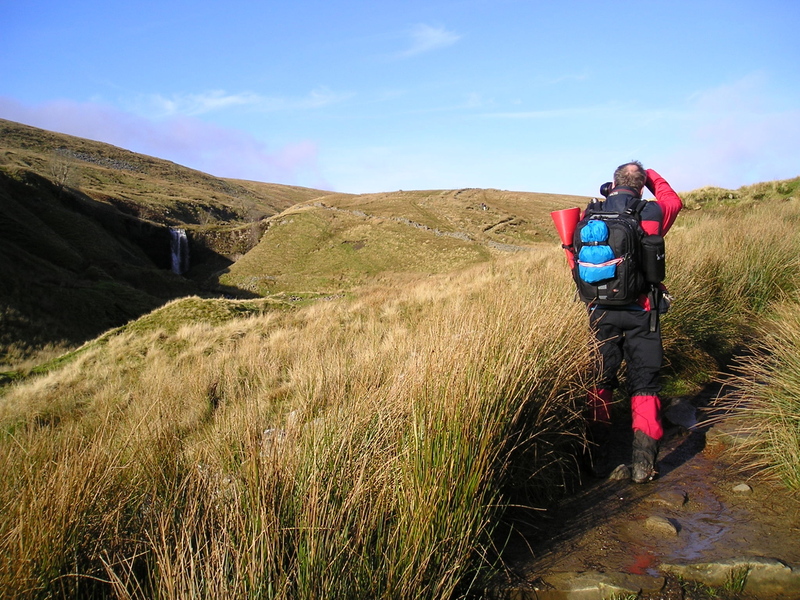 It’s taken about 500 metres north of Cautley Spout in the Howgills on the descent to Bowderdale Head. 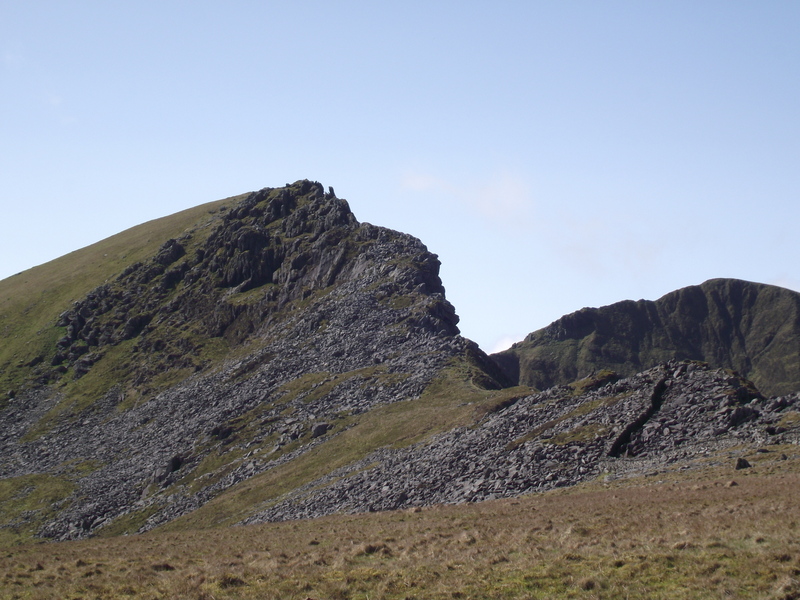 The high point on the left is Great Dummacks and you can pick out the curve of the top of Cautley Crag where the shadow starts. Seadide shot is Wales (well done) but further north. 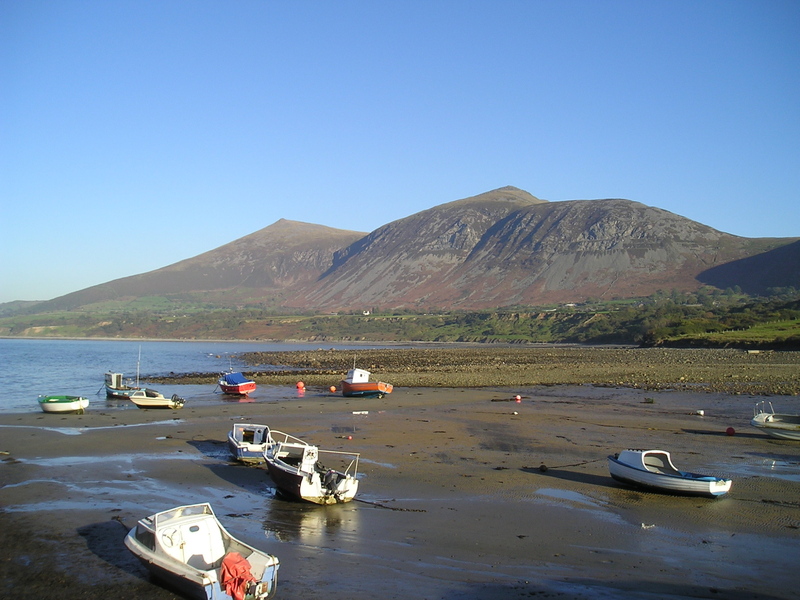 The pic was taken at Trefor just off the A499 Caernarfon – Pwllheli road, and the peaks are Gyrn Goch (left) and Gyrn Ddu (right). 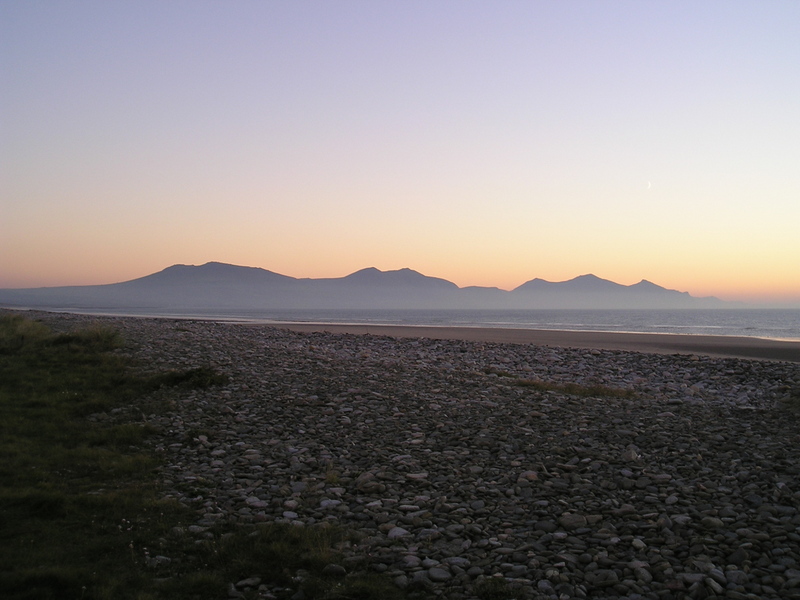 The ‘Sunset over the Llŷn Peninsula’ pic shows the same peaks in the centre, with the three peaks of Yr Eifl to the right – pic taken from Morfa Dinlle near the Caernarfon airfield. I did wonder about the Lleyn Peninsula for the seaside one but only really know the Yr Eifel range down there and I knew it wasn’t those. 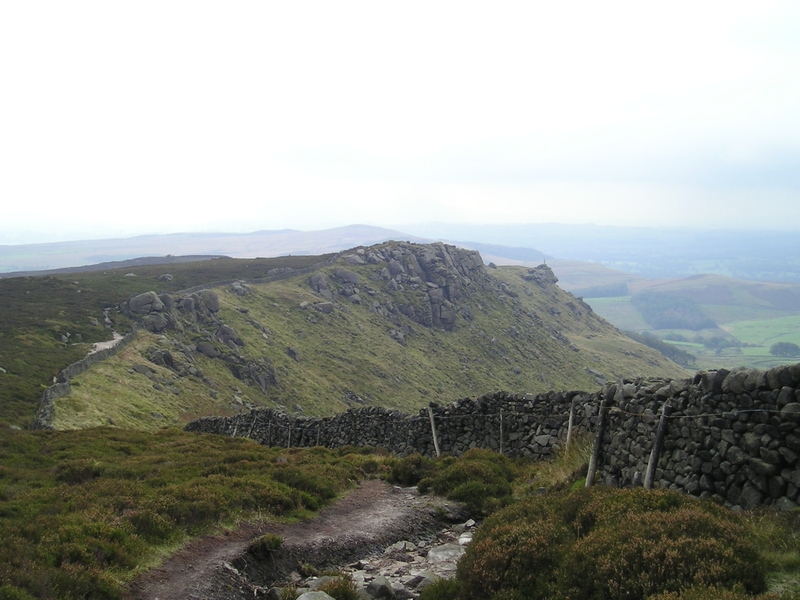 Another area where I’d like to get down to some hillwalking! 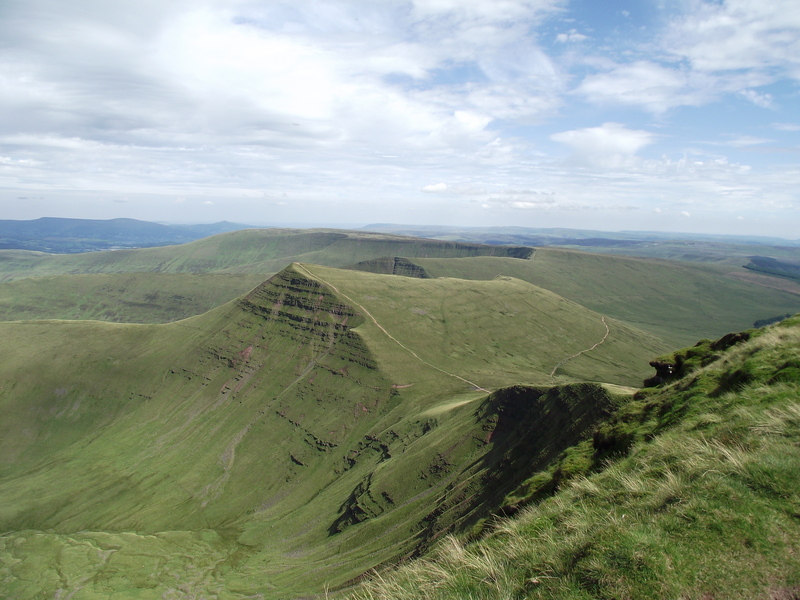 Gyrn Ddu and Gyrn Goch can be combined with a nice little circuit starting from Clynnog Fawr and aiming for Bwlch Mawr to start with – for small hills they give a long day out, but you start fairly low as in some Scottish walks. I’d definitely be interested to see a report on those – doesn’t matter in the next couple of months or so in my case of course!